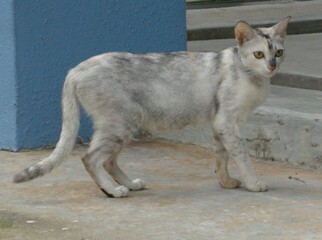 Torbie tuxedo female with long tail, est birthdate: Aug 2008. 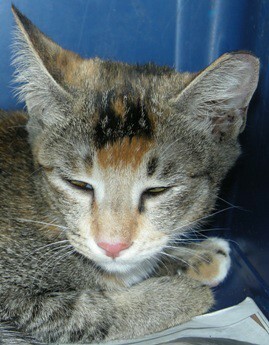 Litter-mate of Brayden, Brenna, Brennan and unnamed agouti (MIA since late December 2008). Child of Brina. Sterilised 5 Feb 09. MIA 9 Mar 09, with Brenna. 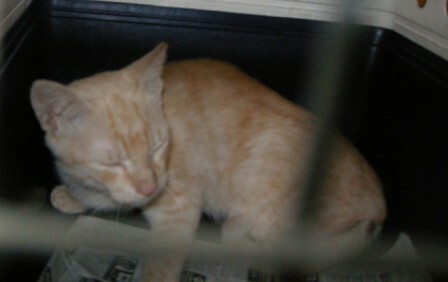 Quick update: Bradley and Saba have been taken earlier tonight… by V for sterilisation tomorrow. At least the situation is starting to get under control. Brielle and Brenna however have disappeared since 9 Mar 2009. 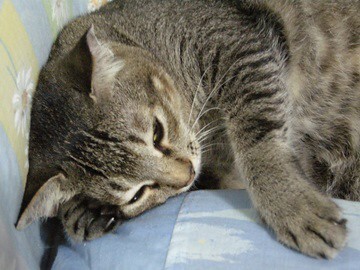 Scottie has been missing since 11/12 Feb 2009. Brielle returned last evening, around 5pm, from her de-mojo adventure. Seems like she coped better than we expected. 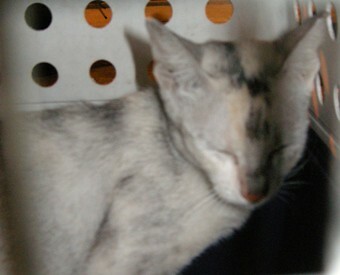 V said that she was actually quite a nice docile kitten, and was easy to manage. Later that night, A and J found her hanging with her sibs, who have been sterilised along with their Mum earlier, as if she’s been there all along, so it’s good news all around. So the one who got away the last time was trapped at about 9.30pm, once again by V.
A and J were also there to help and lend moral support. It was a good operation as Brielle walked into the trap herself, thus saving herself some stress. As her sibs cooperated and stayed away while she mosseyed around and tip-toed everywhere but into the trap for the better part of 20 mins, they were also spared the trauma by association. As with her family’s trapping, this operation brought us some good cheer. It so happened that a resident in one of the ground floor units came up to watch us standing around waiting on Brielle. He, as it turned out, was a residents’ committee (RC) member of Area2 and supportive of TNRM. 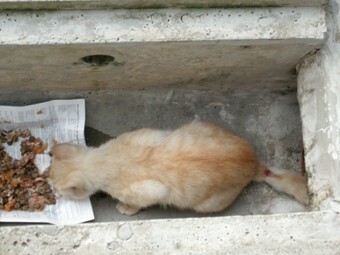 He even offered his contact number should we encounter issues with feeding or trapping in future, and promised to let us know if anyone complains about cats. Another nice encounter was a lady carrying a large donut package, who was passing through. She obligingly stopped and waited along with us when she noticed us milling humans, the trap and the scaredy Brielle. She also considerately spoke in whispers with us. 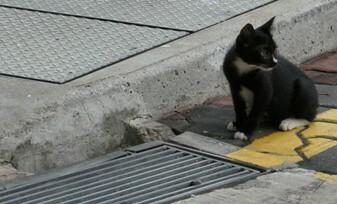 Usually, passers-by don’t miss a beat and continue on through, oblivious to the situation. After Brielle was secured, we went on to try for Bradley, but unfortunately, it was still not meant to be, after 2 previous abortive attempts. Meet the dilute calico and her family, aka Brina and her babies. The family’s first photo-shoot was on 1 Jan 2009. Unfortunately, the agouti kitten was MIA by this time, and we discovered a wound on the top-side of the base of Brenna’s tail. Brina is a great mum, very attentive and watchful. She’s always the last to eat, keeping a watchful eye while her kittens scarf down food with abandon. She picked a great place for the family as there’s a network of drains with multiple difficult-to-get-at exits which are easily accessible to them. 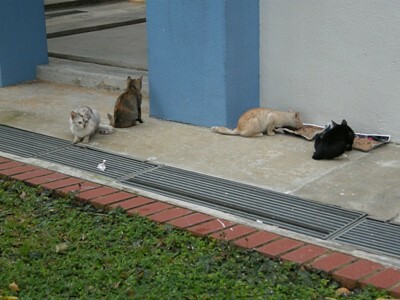 Great for the kitties but unfortunately, it’s right by a very busy walkway, right by a very busy traffic intersection which got us worried about their safety in terms of visibility and in situations where they get spooked and scramble every which way. But we were also optimistic as Brina has obviously been quite successful with raising her babies. 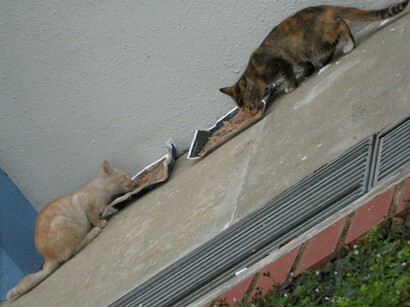 We’ve been catching glimpses of the kittens, singly or in pairs, since December but never the whole family together. The sightings were always while we pass by on feeder services rushing out to work in the morning. We were not able to locate them when we made our way over to the spot on foot. So we did not make the connection between Brina and the flufflies we kept catching glimpses of until December 2008, when the kittens were more grown up and starting hanging out with their Mum, typically avoiding the early morning and evening human traffic. 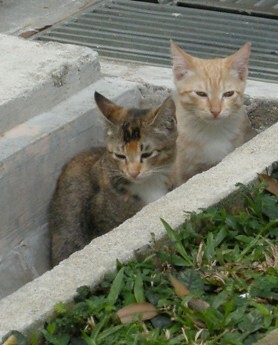 They are typical drain cats, disappearing into the network at the first sign of threat. 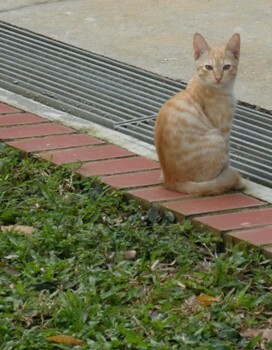 The first kitten I saw was the now missing agouti. 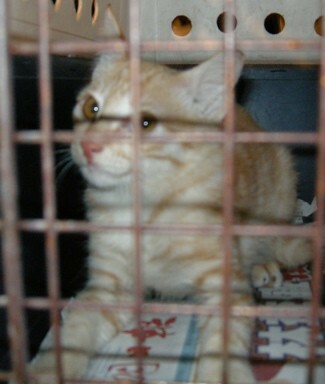 btmao’s first meeting with the kittens were sightings of Brayden. 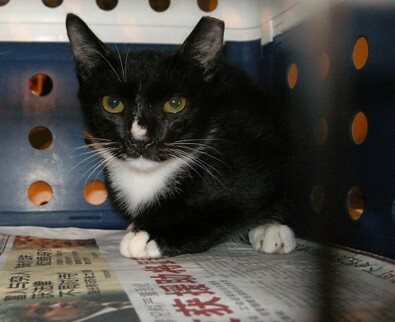 Unfortunately, by the time we established their schedule and took their first pictures on 1 Jan 2009, the agouti kitten was missing, and Brenna was spotting a very raw looking wound on the top-side of the base of her tail. As there are a few dog packs running around, it seemed the most plausible explanation for the missing kitten and Brenna’s injury. Since the whole family was completely wary of people contact, we could not get a closer look nor to clean it. We could only observe and hope it was a clean wound that would heal. As the kittens seemed rather small, we decided to monitor them until they were older before sending them to be de-mojoed. Then we started observing them, hoping to determine their respective sexes. Brina was so named because it seemed apt – protector. Brayden and Brennan were rather easy to identify as they were the bolder ones. 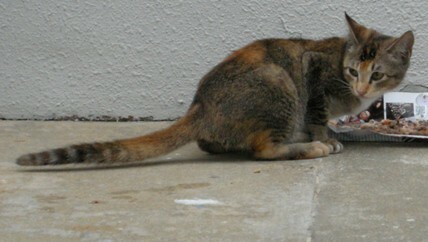 Brielle, being a torbie, was almost certainly a female. 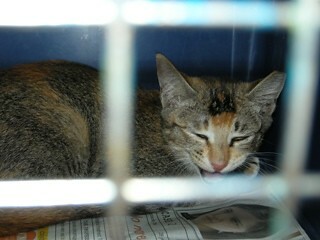 Brenna took us a few more days to confirm and name. 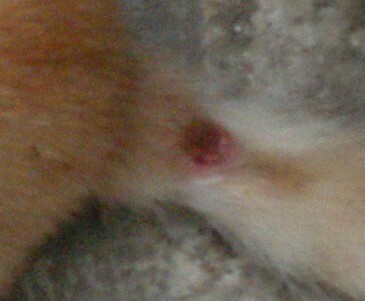 We finally got a better shot of Brenna’s wound 2 days later, while she ate in the drains. It looked better and seemed to be drying up. Also, as Brenna was able to use her tail, we decided to leave it alone rather than try to get her to a vet, as the pre-requisite capture experience might jeopardise plans to get her and her family sterilised. During the following days, the wound would alternate between getting dryer and less red, and newly raw and angry. But after a week or so, it started to really get better. On the night of 22 Jan 2009, all but Brielle walked willingly into traps set by V, and were sterilised the next day. We were worried for Brielle, as she was the one who seemed most attached to Brina, but she survived 3 days and nights on her own, and was rewarded with reunion on Chinese New Year’s eve. At night, back her family came, on the day of reunions, minus their left ear tips. Brenna. Thankfully, her tail checked out ok.
Brielle wasn’t in sight when the carriers were hauled out and the newly tipped ear ones starting meowing. We placed the carriers right in front of the most obvious entrance to their home and started with Brina and then Brayden, who shot off like launched missiles and overshot the entrance. The Brenna and Brennan missiles sputtered, quickly retracing their steps in and scurried into the entrance. Then what should we see but Brenna coming out an exit a few metres away, Brielle shadowing her. They nose-kissed and then disappeared together back into the drains. Since then, we’ve not seen Brina with the kittens though we’ve sighted her, seemingly on her own, in a similar drain network 2 blocks away. 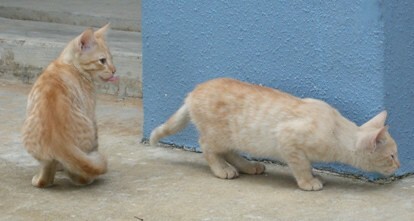 The kittens are still at their original home, and together. We will arrange for Brielle to visit the vet as soon as possible.